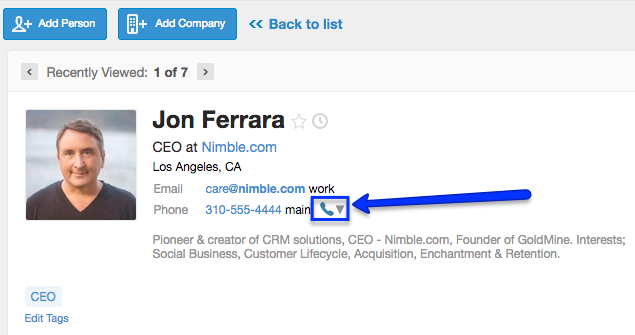 This is an overview of how our "Click to Call" function works in Nimble. This feature support Google Voice, Skype, and other phone systems that accept "callto:" URLs from a web browser. 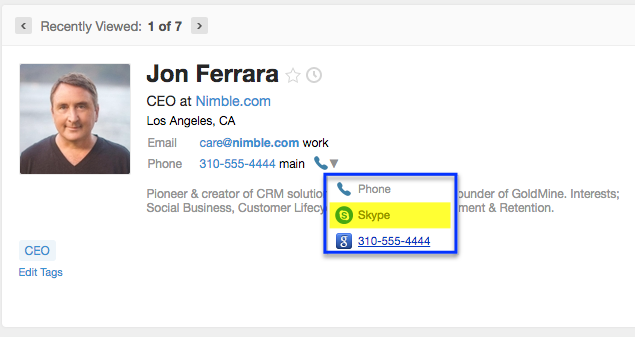 You may now dial your contacts, directly from the Nimble contact record! Note: For Google Voice, this feature will only work for phone numbers that have hyphens (-) or periods (.) separating the digits. For the US standard 10 digit phone number, Nimble will insert hyphens for you. For all others such as international numbers, you will need to manually input hyphens in them. 1. Go to a contact record with a phone number, and select a call option from the phone drop-down icon. 2. Next, select an option to call (Google Voice, Skype, or any app that accepts "callto:" commands). 3. After you select an option, a phone call will launch, and you'll be on your way! If you are having trouble with Google Voice, you must install the Google Voice browser extension. This function only supports Google Chrome, here is the link to download the extension. Note: Phone calls will not register under the "Last Contacted" field on a contact record. For now, we only count correspondence via email or Twitter for "Last Contacted" events. Phone calls will also not update the "Stay in Touch" reminder. If you wish to manually reset your reminder, you can create a "Log Touch" to remind yourself that a call caused the reset.